Our Panoramic™ Design collection was developed by seasoned exhibit space designers. The collection reflects universal solutions that would work well alone or with existing exhibit spaces. 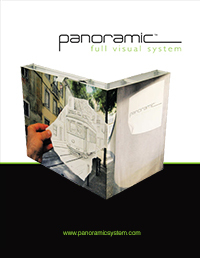 Save time in the design phase and select an existing Panoramic™ Design to create a complete display. Since Panoramic™ only shows graphics, your artwork will carry the look and feel of any exhibit! With Panoramic™, the entire display is covered with graphic so your image will be on both sides of the wall.